Memories are made as invest in the lives of others. Adventures together make lasting impressions. 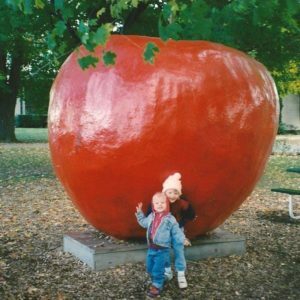 Today, my teenagers posed for a photo in front of the same giant red apple where we have taken their picture for years. We visit the same apple orchard almost every autumn. 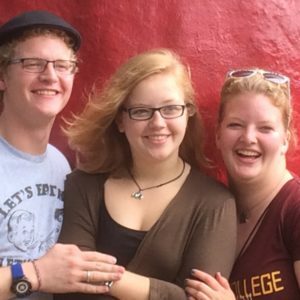 They are now too old to care about riding the hayride, or meeting the Apple Queen to get an apple sticker, or wandering the corn maze, but there is still adventure to be had. All the years of sipping hot cider by the fireplace and eating cinnamon donuts make this the place everyone is excited to come on a cool Fall Saturday. We have watched the farmers press apples into thousands of gallons of fresh apple cider over the years. Every gallon is as delicious as we remember from years before. We retell stories of previous visits, remembering how cold it was once, or that other time this or that friend came with us. From the time we were first married and we bought the angel for our family Christmas tree from the craft barn to this visit today, we have established memories on this little farm just by being here together. Establishing seasonal traditions helps point us to God. The faithfulness of regular traditions reflects the faithfulness of God who gives the rhythm of seasons to his creation. There is a time for every purpose under heaven and shared traditions draw us into God’s heart. We can weep together at the Good Friday service and celebrate together sharing a Thanksgiving meal. Celebrating the wonders of God’s unique blessings in every season is a worthwhile family endeavor. The traditions of each season draw us into fellowship with one another. We make memories, have fun together, and set aside time from the business of our lives to invest in one another. It does not need to be expensive or extravagant. Time together is much more significant than the money spent. We set our calendar by the times that we spend together. New traditions can always be added. When we lived in Boston, we chose to celebrate Spring with the Patriot’s Day Parade. When we moved to the Chicago suburbs, we made a Christmas trip downtown for a burger and holiday displays a new tradition. Summers in Michigan include eating peach pie on the shores of Lake Michigan. Every place has blessings to enjoy if we look hard enough! Delight in the wonders of your corner of God’s world. Every part of the world has something unique to investigate. When we lived in Canada for a single summer, we opened the community paper and chose some adventures in area parks. We enjoyed a BBQ rib fest, a symphony concert in the city, and even bed races at the Strawberry Festival in a local town! Take pictures to celebrate time spent together. Documenting the fun will preserve details of the day to enjoy years down the road. Pictures have a way of helping us relive the moments that we have spent together. You can look back and remember which friends came along or laugh at the stylish fashion choices you made back in the day. Making memories is more about being together as a family than a burdensome plan. How will your family create memories together?